If I had been paying attention, I should have pulled two drives from the four-bay TS-431P Craig recently reviewed, run RAID 1 tests and saved us all a separate review. But I didn't, so QNAP was kind enough to send a TS-231P for this brief separate review. As you may have guessed, the TS-231P and TS-431P are cut from the same cloth, or more to the point, use the same main board. Both are powered by a dual-core 1.7 GHz Annapurna Labs Alpine AL-212 backed by 1 GB of DDR3 RAM and 512 MB of flash. There's also a single-bay TS-131P that's powered by the same platform, but has a different board with only one Gigabit Ethernet port. The comparison table below, clipped from the TS-X31P series spec sheet, provides the vital specs of the three products. For more detail, check Craig's TS-431P review, linked above. 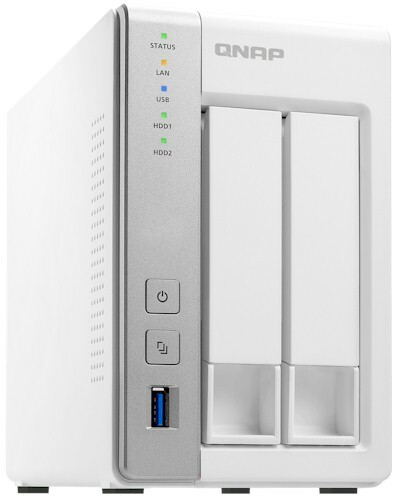 The Table below shows the key components for the QNAP TS-431P. The TS-231P drew 15 W with two of our stock WD Red 1 TB (WD10EFRX) spun up and 9 W in power save mode with the drives spun down. Fan and drive noise was rated very low (mostly drive noise). Firmware version 4.2.4 was loaded onto the TS-231P and performance tests were run using the Revision 5 NAS test process. All tests were run using Western Digital Red 1 TB WD10EFRX (x2 SNB supplied). I periodically scan the Charts database, move discontinued products to the Archive and re-run the Ranker. I did that while preparing this review, with the result that Synology's DS216 is now the top-ranked RAID 1 class NAS. The NAS Ranker performance summary for the two products is below, so you can see how the sub-ranks came out. Most everything is pretty dang close here, with the DS216 better in some areas, i.e. read benchmarks and the TS-231P better in others, i.e. directory copy writes. Seems like it's hard for manufacturers to make inexpensive NASes these days that can't saturate a Gigabit Ethernet connection (or just about) when handling large sequential files. Of the 18 two-bay RAID 1 products tested with the latest Revision 5 process, all but eight can write to a RAID 1 volume at 100 MB/s or better and all but seven can read faster than 100 MB/s. So when choosing a NAS, don't get too hung up on having to get the #1 ranked product. In real life, you'd be hard pressed to see a performance difference from any NAS capable of 100 MB/s + large sequential file handling. Although the TS-231P isn't the top-ranked NAS, with a #3 rank and around $25 cheaper, it's a better buy. But not as good as Synology's Marvell-powered DS216j, which is also ranked #3 and costs only $170.